I have been so internet MIA lately. Normally I am always updated on twitter, checking everyone's blogs daily and taking photos for posts. But this past week I went on twitter maybe once or twice, hadn't even gone on my computer, only checking email on my iphone, and barely taking any photos. Bad week for blogging, good week for actually having a personal life! I made this Dutch Baby one weekend for breakfast, because of some extra blueberries that we had left in our fridge. 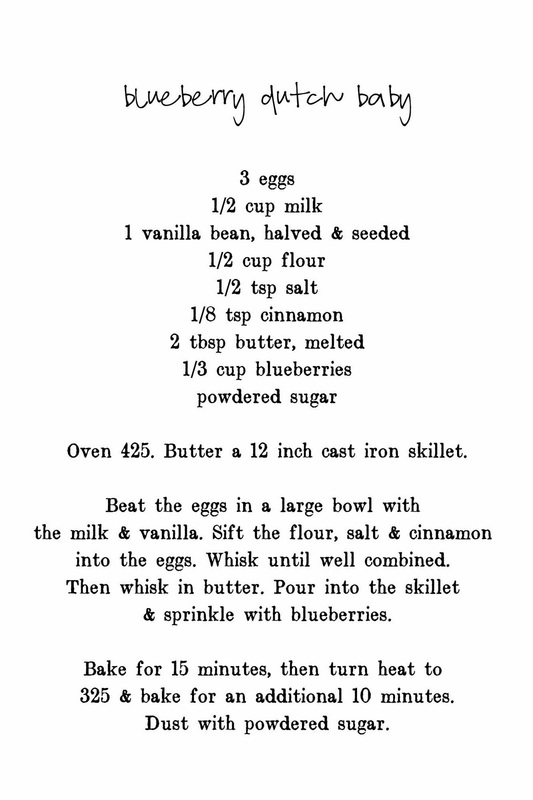 A simple recipe of just whisking a few basic pantry staples together to make one of the best 'pancakes' I have ever had. It was fluffy yet crispy, light but full of flavor. Sprinkle any kind of berries of small chunks of fruit on it to make one of your own. The batter of the dutch baby is in itself not sweet, but once you put that first dusting of powdered sugar, it instantly melts into the surface. Making a perfect breakfast or brunch staple. This weekend me and my boyfriend were on the quest to find Halloween costumes. We set out Monday to search out the local costume stores, malls, shopping centers, anywhere we could think of to find an outfit. We both got a few things, but of course nothing at all that was for costumes. Him a new fancy jacket and a shirt, me a few dresses and the most ridiculous shirt saying 'FREE WHEEZY' from the clearance bin at the mall. The minute he pointed it out to me, knowing my obsession with all things Lil Wayne, I started jumping up and down. Throwing it on immediately over my clothes. So ecstatic about a shirt that looks quite absurd on a tiny blonde girl. But I love it now and while on a break at work, an older woman saw me wearing the shirt and yelled to me 'Lil Wayne!!!' then just smiled and walked away. Most epic shirt yet. I love a dutch baby...great photos! awesome!! No need for the oven, and thousand of combinations to try! Love it! Love the pictures, too! great recipe - i love that it's baked. will be trying this! mhh yum, i love a good dutch baby. 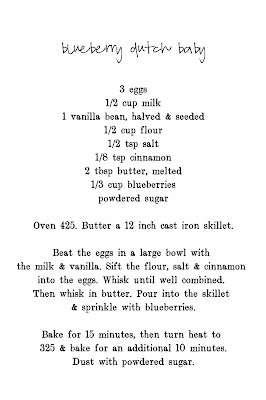 Never thought of adding blueberries. Looks delicious though. Need to try it soon. A squeeze of lemon and a squeeze of Lil' Wayne, these dutch babies are making me hunnngry! Gorg! That looks so yummy!! Maybe I'll try it this weekend. I love Dutch Babies! And, as always, your photos are amazing. Absolute artistry. Your baking. Your photos. Gorgeous. after a long horrid day I made this last night to cheer myself up - amazingly simple and so so yum! am trying you banana cake this weekend! so happy I found your blog! love the dish name. love the photos. hi julie! Such beautiful photos in this post :) The dutch baby looks delicious - what a treat for breakfast! Could one use a regular nonstick skilled it they didn't have cast iron? Looks so good I made one this morning. I was so pleased with the result, I blogged it. It looks just perfect. Beautiful pictures! Goodness! This looks too yummy!! That looks so good. And I bet my husband would love me even more if I were to make this. Thanks for the recipe! I need to get a halloween costume, but I have no idea what to be! Gorgeous Post.. The photos, the food.. it's all DELICIOUS! I just started making my own bread, now I really want to make this!! As always, amazing photos! I made this on Sunday and it turned out pretty good. When I took mine out from the oven it was very light and puffy, but then after a few minutes it started to shrink, so it didn't look as pretty as yours, but my husband really loved it! Thanks! Hey grammar police! I don't care! Pinterest keeps bringing me back to your site...haha! I'll have to try this one too! I am surely going to love this if I would be having it, going to have it asap. Why did you make such a mess for such a simple recipe? Found you on Pinterest and now I just HAVE to make this. It's 90 here in So Florida, but I am preheating the oven. Looking for a different post like these.i would like to appreciate your good work and also want to encourage you to keep them improving. I would love to know more about this so posting more would be appreciated. wow ~ so great! yami! Sufficient Guild Wars 2 Items for sale with fast delivery ! I am very pleased with the articles that you create. This article has me looking from the past and only now I found it. Improve the quality of your articles and continue to create a more interesting article. Hopefully you can create a new article in the not too long because I can not wait to read your next article. Thank you for your hard work. These pictures are stunning, they look so wonderful. I want to make this recipe next weekend! Nice to be here ! Very effectively written information. Will probably be useful to anybody who usess it, together with myself. Keep up the nice work - for positive i'll check out extra posts. Good post….thanks for sharing.. Very useful for me i will bookmark this for my future needed. thanks for a great source..
Well that's nice work! Interesting post and thanks for sharing. Some things in here I have not thought about before.Thanks for making such a cool post which is really very well written.will be referring a lot of friends about this.Keep blogging. thanks for the sharing. I made dutch babies this morning for my son before his drivers ed class. He loves them. I never thought about adding berries. I have been making them for over 35 years. Thank you for the inspiration. I make them savory and sweet. Your recipe is very similar to mine. Thanks for the tip! I have been making them for over 35 years. Thank you for the inspiration. I make them savory and sweet. Your recipe is very similar to mine. Thanks for the tip! Well that's nice work! Interesting post and thanks for sharing.